The Japanese space agency has set dates for its historic plan to explore the surface of an asteroid with robots. The Hayabusa-2 spacecraft reached the asteroid Ryugu in June this year after a three-and-a-half-year journey to the spinning top-shaped space rock. Officials have picked days in September and October for the deployment of separate robotic landing craft from the Hayabusa-2 "mothership". The robots will be despatched to separate locations on the asteroid. If all goes well, Hayabusa-2 will be the first spacecraft to successfully deploy landers to gather data from the surface of an asteroid. The 1km-wide space rock known formally as 162173 Ryugu belongs to a particularly primitive type of asteroid, and is therefore a relic left over from the early days of our Solar System. Studying it could shed light on the origin and evolution of our own planet. Hayabusa-2 was launched from the Tanegashima Launch Center in far southern Japan on 3 December 2014. It has been carrying several science instrument payloads for release on to the surface of its target, Ryugu. On 21 September, it will despatch the first of these piggybacked packages. A 3.3kg container known as Minerva II-1, which is mounted on the spacecraft, will deploy two robots known as Rover 1A and Rover 1B. The 1kg "rovers" will actually move by hopping under the asteroid's low gravity. Each one contains a motor-powered internal mass that rotates to generate force, propelling the robot across the surface. The rovers are equipped with wide-angle and stereo cameras to send back pictures from Ryugu. Then, on 3 October, the mothership will deploy a lander called Mascot, which has been developed by the German Aerospace Center (DLR) in conjunction with the French Space Agency (CNES). Mascot, otherwise known as the Mobile Asteroid Surface Scout, is a 10kg instrument package that will gather a range of scientific data from the surface. It carries a wide-angle camera, a microscope to study the composition of minerals, a radiometer to measure temperature and a magnetometer to measure the magnetic field. After it reaches the surface, Mascot can move its position only once, by jumping. But the asteroid's rough surface could make landing risky. "The surface of Ryugu is covered with boulders, so we need to continue gathering and considering information so that we can touch down safely," the mission's official Twitter account stated. The biggest of these, near the South Pole, is estimated to be around 130m - about the same as the height of the London Eye. Another lander, known as Minerva II-2, which has been built by a team at Japan's Tohoku University, will be deployed at a later date. 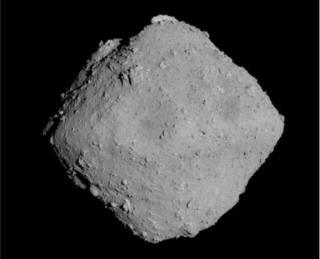 Even further on in the mission, the Japanese Aerospace Exploration Agency (Jaxa) plans to detonate an explosive charge that will punch a crater into the surface of Ryugu. These samples will then be sent to Earth for laboratory studies. The spacecraft will depart from Ryugu in December 2019 with the intention of returning to Earth with the asteroid samples in 2020. An American asteroid sample return mission, Osiris-Rex, will rendezvous with the object 101955 Bennu later this year.